Former art students, colleagues, and friends of Tony Askew made this exhibition possible. 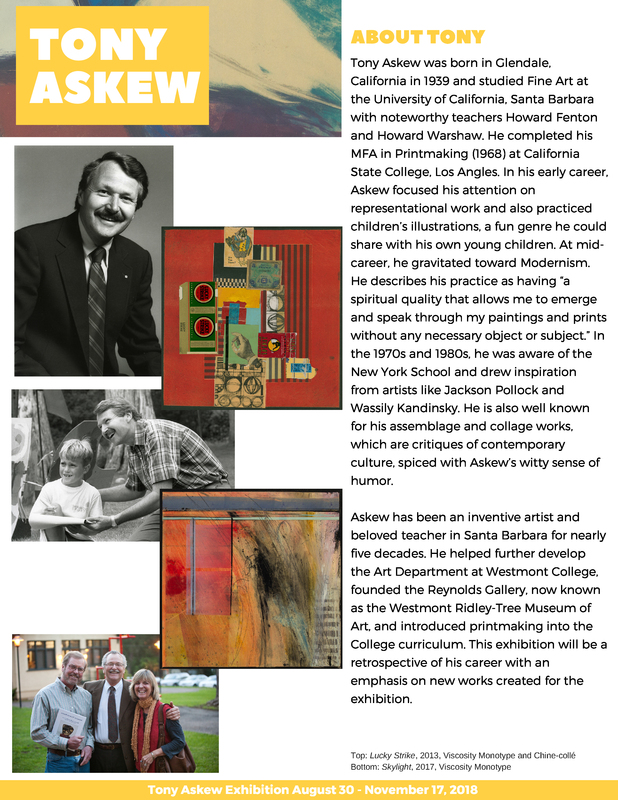 R. Anthony Askew, best known to his friends as Tony, has been a beloved art teacher, an arts advocate, and most importantly, an amazing artist in our Santa Barbara community for over 46 years. He retired from Westmont College ten years ago, after establishing our printmaking program and founding Westmont‘s Reynolds Gallery, now known as the Westmont Ridley-Tree Museum of Art. Currently, you will find Tony teaching art at the Santa Barbara School of Extended Learning, attending nearly every art opening in town, and jurying important exhibitions. He is a printmaker, collage and assemblage artist, and a watercolorist. Tony has a gift for affirming students and friends through his kind and gentle spirit. Highly anticipated, the Westmont Ridley-Tree Museum of Art will organize a retrospective of Tony’s celebrated art career opening in the fall of 2018. We will feature a range of older works and new works created specifically for this exhibition. There will be a published catalogue with essays by Josef Woodard and Siu Zimmerman. Walter and Darlene Hansen, a Trustee at Westmont and both art lovers, stepped forward with a leadership gift of $10,000! We are so grateful! Walter and Darlene Hansen want to leverage their sponsorship with a challenge for us to match their gift 2:1. That means we need to raise an additional $20,000 in support of the exhibition and catalogue. Help us recognize Tony’s distinguished career. You can send a check to the Westmont Ridley-Tree Museum (955 La Paz Road) and write "Tony" in the memo line, or you can give online at www.westmont.edu/giving. When giving online, please select "Other," enter the dollar amount, and type "Art Museum - Tony Askew Exhibition" in the "Designation." We kindly suggests donations of $1,000, $500, $100, or $50. We thank you in advance for considering a gift to help us honor a Santa Barbara treasure and powerhouse – Tony Askew! Gifts mailed in after July 25, will be recognized on the exhibition wall and on the website but not in the exhibition catalogue. Questions about giving? Call the Museum at 805-565-6162 or email museum@westmont.edu.